We can make a provisional booking for your group to guarantee availability and prices quoted to you (this will allow time to source flights etc). All provisional bookings must be advised in writing and an expiry date agreed. In order to fully confirm a group booking – a 25% non refundable booking deposit is required. The final payment for group bookings is due 6 weeks prior to arrival date. For groups booked less than 8 weeks prior to arrival date – full payment is required at the time of booking in order to confirm your group. Four weeks prior to arrival date – we require a name list of all participants in your group,their estimated time of arrival at the hostel we have booked for them (so that they know who the group members are and what time to expect them at the hostel at) and group leader name and contact telephone number. Groups of 8+ persons are required to fill in a code of conduct form upon check in at our hostels and leave a full refundable security deposit of € 20.00 pp (or min € 300.00). Provided no damage is caused at the hostel during the group stay – the security deposit will be refunded in full on check out. If damages are caused the management of the hostel will liaise directly with group leader on site re covering for damages. In these booking terms and conditions the words “you” and “ your” refer to the group leader (or Agent) – who accepts these booking terms on behalf of all persons in the group. By accepting the terms & conditions the group leader (Agent) confirms that he/she is so authorised and that all group members agree to be bound by these booking terms and conditions. The group leader must be at least 18 years old. Group leaders are responsible for organising all payments due to Celtic Group Hostels. These terms and conditions apply to groups with max fifty participants – for groups with over fifty participants (i.e. university tournaments – please contact our reservations department for special terms and conditions). Before your group booking can be fully confirmed a 25% non refundable booking deposit of the total due is required by Celtic. No group booking is fully confirmed, until this booking deposit is received by Celtic. NOTE For groups booked less than 8 weeks prior to arrival date – full payment is required to confirm a booking. Final payment must be made 6 weeks prior to the arrival date. If your group’s final payment is not received 6 weeks prior to arrival date – we will send you a reminder to make the payment. Upon agreement we can extend the final payment deadline – However extensions to final payment must be agreed in writing. NB. Failure to make the final payment date may result in your group booking being cancelled and your booking deposit being forfeited. Notes: To validate payment by bank transfer – notification must be received from Bank of Ireland to Celtic Group Hostels. It is important that you allow sufficient time for the transfer to reach the Celtic Group Hostels account. Please check with your bank for details. When making payment by bank transfer it is also important that you reference the payment being transferred to your group name and travel dates and booking reference that we provide you with. All bank charges must be incurred on your side of the transaction. As soon as we have received your credit card details and charged your card – a member of our reservations team will contact you to confirm your payment. Please allow a 3% transaction fee for credit card payments. 6 weeks or less prior to arrival date – 100% cancellation fee will be charged on the amount of participants booked at the time of cancellation. Group amendments less than 6 weeks prior to arrival are subject to availability. We regret that we cannot accept liability or pay any compensation where the performance or prompt performances of services booked is prevented or affected by “ Force Majeure”. In these booking conditions “force majeure” means any event which we or the supplier of the service(s) in question could not, even with all due care, foresee or avoid. Such events may include war or threat of war, riot, civil strife, terrorist activity, industrial dispute, natural or nuclear disaster, adverse weather conditions, fire and all similar events outside of our control. The group organiser/agent agrees to provide full details of group (age, type – junior/adult, school, choir, sport etc) at the time of booking. The Management of your accommodation booked have the right to refuse admission if details provided by you on your group are incorrect. 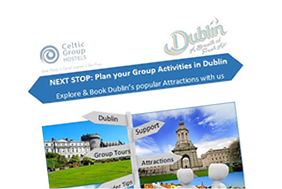 The group organiser/agent agrees to provide flight/arrival details for the group on confirmation and a full name list for the group no later than two weeks before arrival date. In the unlikely event that you have any reason to complain or experience any problems with your accommodation, you must immediately inform the hostel reception at the time in order to allow the hostel to provide a remedy on the spot. Most problems can be dealt with quickly. Issues with services must be brought to the attention of our office at the time of occurance in order to give both the supplier and Celtic Group Hostels the opportunity to resolve the issue. We can not enterain any complaints or requests for compensation if issues are not raised with Celtic Group Hostels at the time of occurance. However, if you remain dissatisfied – we recommend that written notification be given to Celtic Group Hostels A copy of this written complaint with a cover letter (including your group name and dates of travel) should be sent to us within 14 days of your departure date. We regret that we cannot investigate any complaints, which are not notified entirely with this term. In certain cases, Celtic Group Hostels may alter these conditions and cancellation to reservations charges as it sees fit. Celtic Group Hostels agrees to communicate any new conditions to the group organiser/agent at the time of booking.